Often times, society makes us feel like we are one or the other, but in reality, these personality traits are two opposite ends of a spectrum, and most of us fall somewhere in the middle (source). Susan Cain, researcher and author of the New York Times bestseller, Quiet: The Power of Introverts in a World That Can’t Stop Talking noted that "extroverts need higher levels of stimulation to feel their best” while "introverts prefer quiet, minimally stimulating environments." (source) This stimulation may be social in nature, but it can also be bright lights, noise (radio, podcasts, music, yard work noise, traffic, etc. ), and visual clutter. Those of you who teach or lead or direct in some way may feel energized after being up in front of a group of people (extrovert side of the spectrum) or drained and craving alone time (introvert side of the spectrum), but regardless of how you may feel on the inside, you may feel as if you need to pretend to be energized to portray strong leadership skills. But, being an introvert doesn’t mean you are inferior and it doesn’t mean you can’t lead or teach or direct just as well as those who are more extroverted. The secret is to use your natural strengths (a.k.a. secret weapons). Introverts have a number of unique strengths. These skills and traits are extremely valuable in a variety of teaching and leadership settings, so make sure you’re using them, to the best of your abilities. You value authenticity and truth and strive for clear, honest communication and feedback. Balance this with kindness and awareness of how others receive feedback and suggestions. You do good work and pay attention to details. Take breaks and make sure to have other hobbies and things to fill your time so you don’t get burnt out. You are introspective and reflective and think carefully about how to teach, present, and communicate with others. It’s easy to get wrapped up in what others might think, but don’t let that fear hold you back. You pay attention, observe, and listen before you speak. Make sure you find a way to express your thoughts and don’t just defer to the more extroverted people in the room. Large groups may be draining, but you are able to form deep, personal connections with others, one-on-one or in small-group settings. 1. Work alone before rehearsal. Do something relaxing, play through your music (half work, half fun), or work on a creative project of some kind. Leading a rehearsal for however large a group of people can take a lot of you, so make sure you prepare accordingly and don’t exert too much social energy earlier in the day. 2. Look for opportunities to connect. Get to know your choir members - their interests, their families, what is important to them - and, in turn, share parts of your personal life, as well. Talk to people one-on-one or in small groups as they arrive (an introvert’s strength, remember?). This is the best way to encourage authenticity and connection and build community among your choir. 3. Be honest, but kind. As I mentioned before, honesty is a trait most introverts naturally have, but there is such a thing as being too honest or blunt, sometimes. 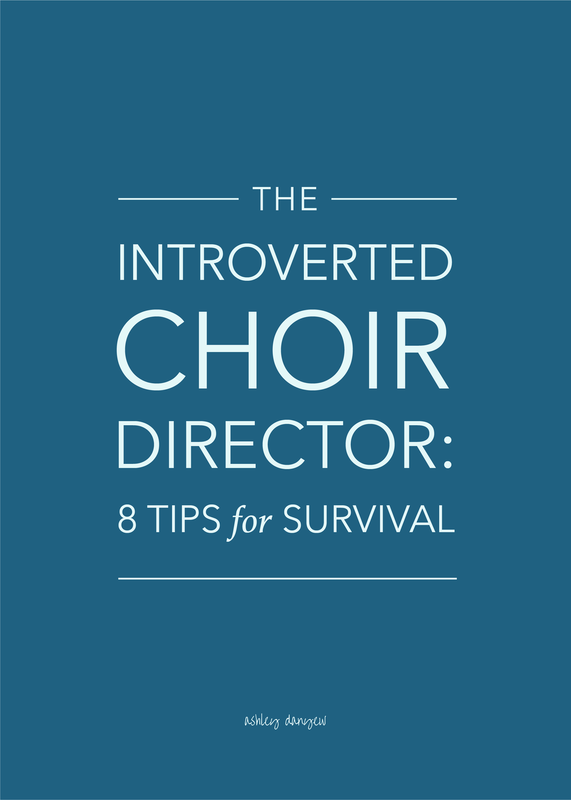 As an introvert, you may appreciate directness and value honest opinions, but some of the people in your choir may not feel the same way. Be careful not to disregard people’s feelings; instead, be honest, but give feedback kindly, gently, and respectfully. 4. Take time to be quiet. Introverts are often more sensitive to noise and visual stimuli than extroverts. Listening to podcasts, watching videos or stories on social media, reading articles with busy ads and banners on the webpage, even just listening to music (with lyrics) on the radio can be draining after a while. Prepare for rehearsal (or an evening of rehearsals) by taking time to recharge and be quiet. Read a book, go for a walk, do some reflective writing, or creative work of some kind. 5. Focus on your physical presence in front of the group. According to Anett Grant, introverts can develop a strong leadership presence by focusing on these five physical things: a) balance, b) eye contact, c) vocal resonance, d) smooth gestures, and e) intentional movement. Read more here. 6. Focus on your speech. Similarly, Anett Grantalso recommends a few mental things to focus on when speaking to a group: a) get to the point, b) use imagery, c) get into a rhythm, d) make sure the content is relevant, and e) use active voice. Read more here. If you know that being around people drains your energy, avoid scheduling meetings or lessons or extra rehearsals on the same day as your choir rehearsal. Set limits on when you check and respond to emails, and put your phone on Do Not Disturb for a few hours while you’re working to avoid being interrupted. 8. Take time to reflect. Take time after rehearsal each week, either later that evening or the next day, to reflect and plan for the following week. Introverts may take more time to process things than those who are more extroverted, but often it’s because we’re sifting through all the details, things we observed, conversations we had, etc. Build time for this mental processing into your weekly routine. Can you relate to any of these things? What are your best tips for introverts?